In general, when you delete a file, windows just move it to the recycle bin, not really delete it, then the file can be restored easily from the recycle bin. Further more, even if you delete the file from the recycle bin, or press the "SHIFT" key when you deleting it. The file was deleted by windows and can not be restored from the recycle bin. However, windows do not delete files permanently, in most cases, when you using a data recovery software such as Eassos Recovery, the file still can be recoverd. How to delete files permanently? It is very important sometimes, form example, when you borrow your computer to a friend and there are some sensitive files in the computer that you don't want to be seen by others. Don't worry about delete files permanently, using Eassos PartitionGuru, it is very easy. After deleting permanently, the file can not be recovered by any data recovery software for ever! For example, if you want to delete a image file named "mypic.jpg" on desktop permanently, how to do? Run Eassos PartitionGuru, select the file which you want to delete permanently. Right click the mouse and select "Delete File Permanently" item from the popup menu, as shown above. From the popup window, click "Permanently Delete" button to delete file permanently. 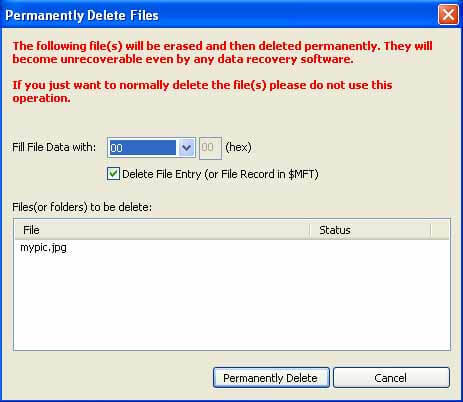 There two options you can setup while you delete file permanently, "Fill file data with" and "Delete file entry". You can overwrite the file data with 00, FF, Random Data or specify a value to overwrite the file data. I recommand you simply choose the default value "00". I highly recommand you check this option, or some recovery software such as Eassos Recovery or Eassos PartitionGuru can detect the deleted file's name, though it' content can not be recovered forever. That all, as you have seen, how simple and easy to delete files permanently using Eassos PartitionGuru.